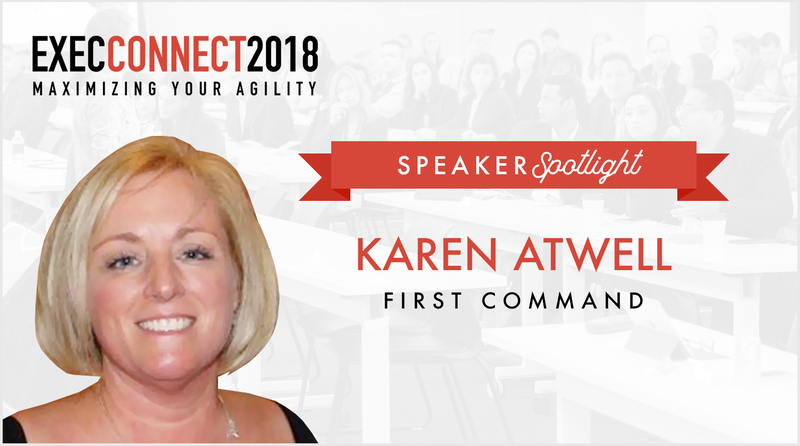 We’re very excited to welcome Karen Atwell, VP Leadership & Talent Development at First Command, as a featured panelist at ExecConnect 2018! Karen is a dynamic leader with over 35 years of management, consulting and coaching experience. Accomplished in talent development, HR consulting, coaching, training, and facilitating, Karen’s current role focuses on innovating new approaches to talent strategy, assessment, succession planning, development, and executive coaching. Karen holds an MA in Organizational Communications from Ohio University and is a Professional Certified Coach with the International Coach Federation. Karen and her family live in Fort Worth, Texas and Deer Isle, Maine. I love to help leaders grow and watch individuals discover what makes them great and how they can improve. To move learners from content exposure to some level of mastery we must find ways to follow learners back to their desks and help them apply their learning. Coaching, mentoring, and quality reinforcement tools are a good start. I think we need to challenge our thinking and truly innovate in this space. I love to retreat to my home in Maine and connect with the community. Giving back is a great way to reenergize. Connecting with peers and listening. I have some good ideas, but through listening, I might be able to make a few of them great ideas!